The very name evokes all that is most wild, mysterious and elusive in nature – for this is an animal that comes cloaked not just in the subtle beauty of its own coat but also in all the high drama of the harsh and magnificent environment that it dominates. Well known for its beautiful fur, the snow leopard has a whitish-tan coat with ringed spots of dark, ashy-brown and rosettes of black. Its tail is heavy with fur and the bottoms of its paws are covered with fur for protection against snow and cold. There are a couple different ways these treks are conducted. First is to carry all your luggage and gear and trek from village to village spending nights in homestays within some of these remote areas. The second option and the one that is preferred is to make a base camp and then each day trek searching for the snow leopard. This way you get to explore in different directions radiating from the base camp. 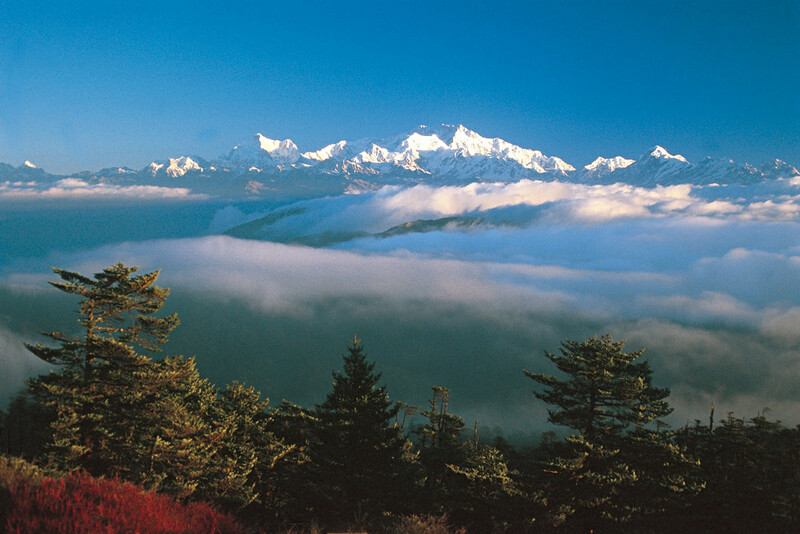 Along with you on your trek you will be accompanied by an expert guide, Khenrap Phuntshog. Khenrap has been associated with the Wildlife Protection Department of Jammu and Kashmir for the last fifteen years and has spent much of his time ‘in the field’ tracking and monitoring the wildlife and birds of the region. He is an expert in the snow leopards as well as being a keen conservationist and wildlife guard and, by default has become a keen wildlife photographer. Having spent most of his life monitoring this region, he knows each hill and valley as well as the territories roamed by the local fauna making him one of the best people to lead this trip. (An expert guide should be booked in advance and can be finalized depending on availability on the requested dates. We do have other wildlife experts in the region with similar profiles). 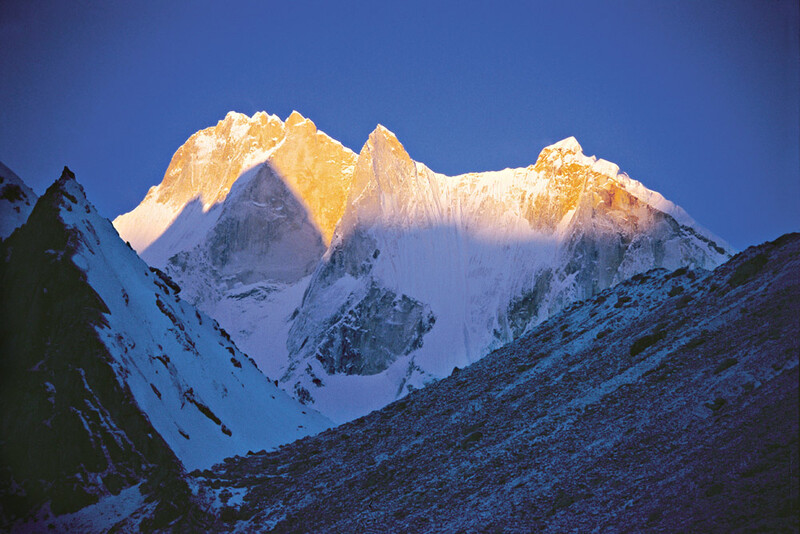 An attractive contrast of the snow leopard trek is the beginning and ending of your tour. 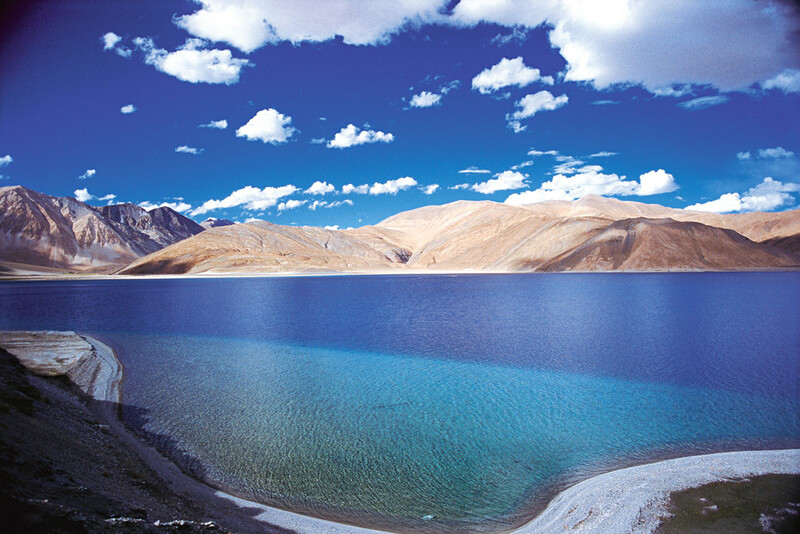 This includes tours of the monasteries in Leh with its picturesque villages and also a city tour of Delhi. Enjoy the culture of the people and the gentle and cheerful Buddhism that they practice. Please note:The Snow Leopard being an elusive and a very shy cat, it is very difficult to get a sight of it during the summer months, but during the winter the snow leopard comes down for water and prey. We have chose the months of this tour specifically as this is the time when they are mating, marked by a noticeable increase in marking and calling. This tour does consist of a moderate to strenuous trek 7 days out of the 14 day tour. The trek is definitely for those looking for a unique wilderness experience, however, with this uniqueness comes the challenges and one must fully understand the situation that they are getting into. This is NOT a luxury safari, it requires a certain level of fitness and flexibility in terms of adjusting to the lifestyle of the area. Uphill climbs and climbing a ridge are possible depending on the movement. Please confirm with your practitioner on your physical fitness level regarding this tour. 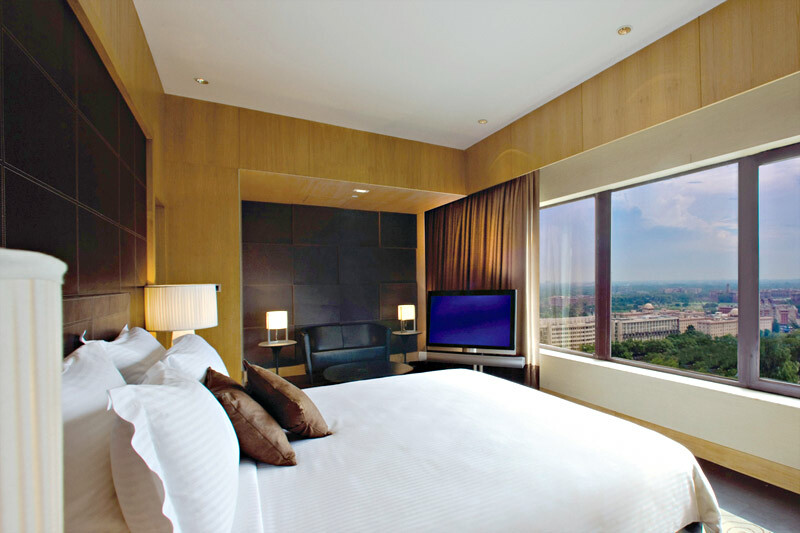 2 nights in Delhi at luxury hotel. 2 nights in Leh at a superior hotel. Accommodation in Hozing on trek (7 nights) in mobile tents with foam mattresses. Arrive at Delhi’s International Airport this afternoon/evening. Welcome to India! You are met by our representative in the arrival area of the airport after you clear all immigration and customs formalities. Depart for your hotel where you will check in (starts at noon) for your overnight stay. Delhi stands as the capital of Modern India. Here you can see the mingling of the Old and New India, the ancient and the modern. Delhi is made up of seven ancient cities, spanning the period from the 11th to 20th centuries. Delhi has seen the rise and fall of many emperors, which was left behind a plethora of monuments that commemorate the grandeur and glory of bygone ages. Very few cities in the world can express such as profusion of architectural styles. Rest of the day is free for independent activities. This flight from the Indian capital to Ladach’s capital will be something that you might remember for the rest of your life. Welcome to Leh, the capital of Ladakh. Met and assist on arrival and proceed to your hotel. There will be no activity on your first day of arrival as it is recommend for tourists to relax and undergo minimal exertion to enable them to get acclimatized to rarefied oxygen level in this high-altitude region ensconced in the high Himalayan plateau. Thiksey monastery is situated towards the East of Leh picturesquely on a hillock, which also houses a two story stucco statue of Maitreya Buddha seated on a lotus, upon arrival we witness the monks gathered in the assembly hall for the morning prayer ceremony, which begins before sunrise at 6am, hear the monks chat their prayers with the beats. After that, you will be guided to visit the other parts of the monastery. 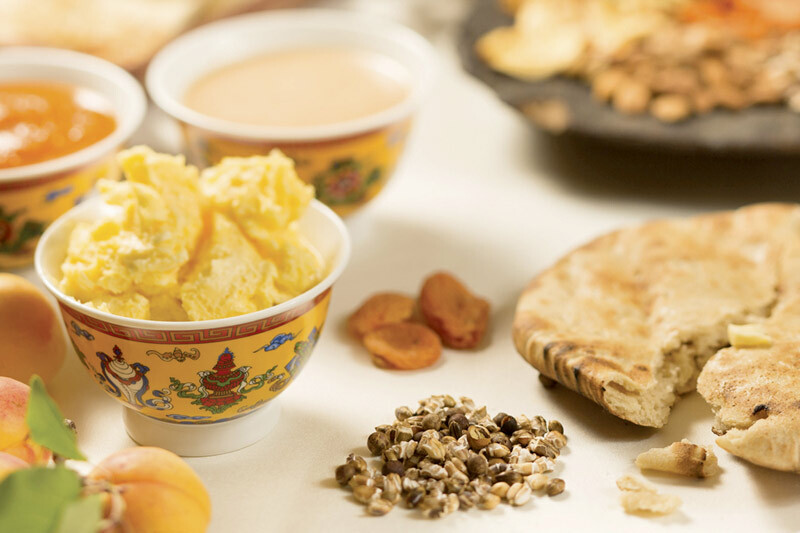 Followed with a breakfast at the Thiksey monastery restaurant. Thereafter drive two kilometers ahead of Thiksey monastery for a photo halt along the banks of River indus and then you will drive to visit Hemis monastery, another 30 kilometers southwest of Thiksey. Hemis is the largest and the wealthiest monastery in Ladakh. Hemis festival is considered amongst the biggest and most famous of the monastic festivals, and is dedicated to Padmasambhava. Every 12 years, the gompa’s means a (monastery) greatest treasures, a huge Thangka, is ritually exhibited. After that, return to visit Shey monastery, Shey was the summer capital of Ladakh in the past. The palace, mostly in ruins now, was built first 1655, near Shey village, by the kind of Ladakh, Deldan, Namgyal, also known as Lhachen Palgyigon. 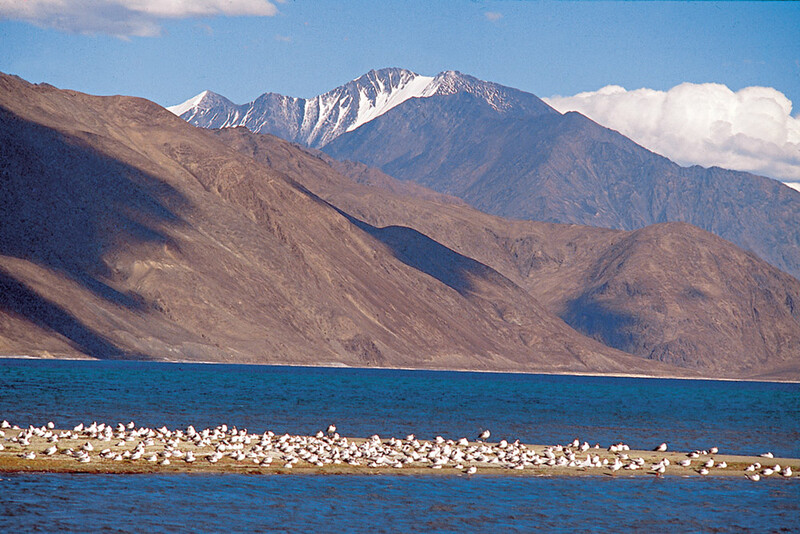 It was used as a summer retreat by the kinds of Ladakh. The Shey Monastery was also built in 1655 on the instructions of Deldan Namgyal, in the memory of his late father, Singay Namgyal, within the palace complex. The monastery is noted for its giant copper with gilded gold statue of a seated Shakyamuni Buddha. Shakyamuni Buddha is so named since Buddha was the sage (muni) of the Sakya people who resided in the Himalayan foothills and their capital was Kapilvastu. It is said to be the second largest such statue in Ladakh. Hozing Valley, which is known for various sightgseeing’s, but then again, it all depends on luck, continue walk back to the jeep able road and then continue towards our right to reach Zingchan Village, which again consists of two – three houses, we continue further off the road along the path and the stream crossing the Wild Life Dept, office with no one around and then crossing the small bridges, before we finally reach our base camp just below Hozing valley, the base camp is marked with a Buddhist flag, the best campsite we can figure around the valley. Later in the afternoon, visit the surrounding area followed with briefing by our guide. Hozing Valley is a very interesting spot for the Snow Leopard as the valley again has good winter grazing, where again you will find hte Bharal, a delicacy for our cat. Feeding with spring waters running all throughout the winter, as the other stream water are frozen, apart from the valley gives a complete camouflage to the Snow Leopard with its rocky, stark jagged mountains. The moment a Snow Leopard has any traces around is informed by our guides and the horseman (locally from the Rumbak village), accordingly we follow and plan the day every morning. Today is an optional visit in search of the elusive cat before we depart. Our camp staff will begin packing and then walk towards Zingchan village, where we will have our vehicles waiting to pick us up and then we return to Leh. 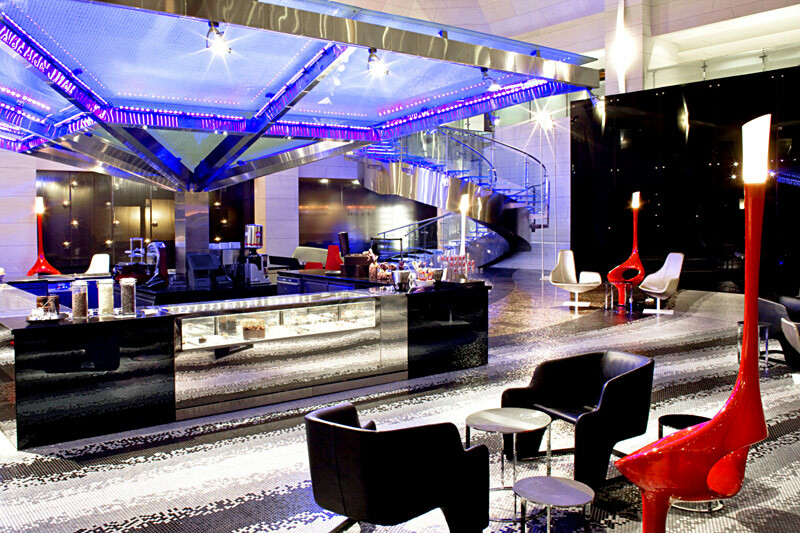 Enjoy breakfast at the hotel and the rest of the day is free. Today you will be woken up early in the morning after a hot cup of tea/coffee and then you will be driven to the airport to connect on your flight to New Delhi, this will be your last opportunity to catch the spectacular view of the Himalayan ranges. Met upon arrival and transfer to your hotel. After breakfast, drive to Delhi airport for your onward journey. 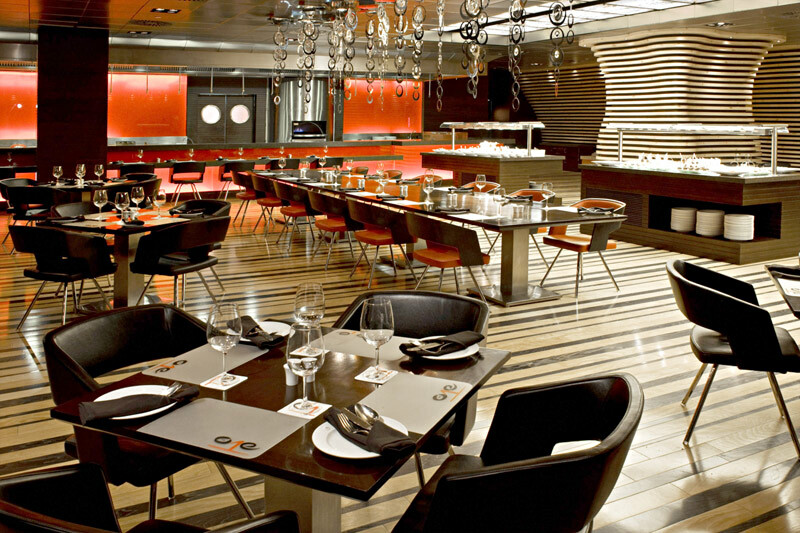 Accommodation:Includes Le Meridien deluxe room for 2 nights. The Grand Dragon Hotel – 4 star category with central heating facility for 4 nights; while on the trek (8 days) using mobile Vaudee trek tents with foam mattress; dining with heat; kitchen; decomposes soil toilet with western seat. 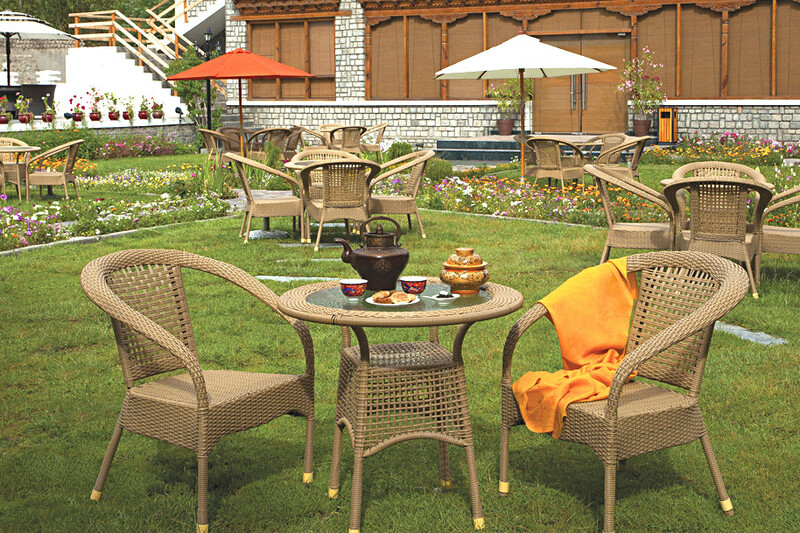 Meals:Inclusive of Breakfast in Delhi and all meals (Breakfast Lunch Dinner) in Leh & during treks. Transportation:Using Toyota Innova as per the itinerary; with pick-up/drop from trekking point. Luggage Van:Includes luggage van to drop/pick-up from the trekking point. 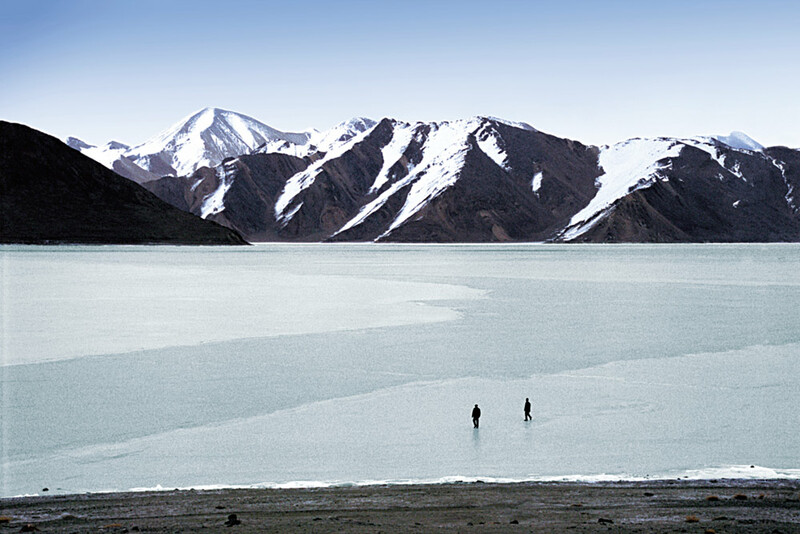 Trek Staff:Includes accompanied cook with assistance and accompanied experienced guide. Equipment:Includes three-season mobile tent; dining tent; kitchen tent; toilet tent all the furniture and crockery’s throughout the trek. Ponies:Includes a service of ponies for carrying the provision all throughout the trek. Water:Includes bottled mineral water in rooms & during sightseeing; boiled filtered water while trekking. Spotting Scope:A common spotting scope. Heating facility:Includes heating in dining tent followed with hot water bottles in bed. First Aid:Includes first aid kit with oxygen cylinders. Airfare charges / extra baggage charges. Insurance of any kind, Camera fee, and laundry charges, alcoholic beverages, mineral water with meals. (Please note: We do not encourage bottled water during trek) Items of a personal nature, tips and gratuities. The five star deluxe Le Meridien is conveniently located in the centre of the city, just over a mile’s radius of major central government offices, Parliament House, the Presidential Palace, Rashtrapati Bhawan and the bustling commercial and shopping district of Connaught Place. 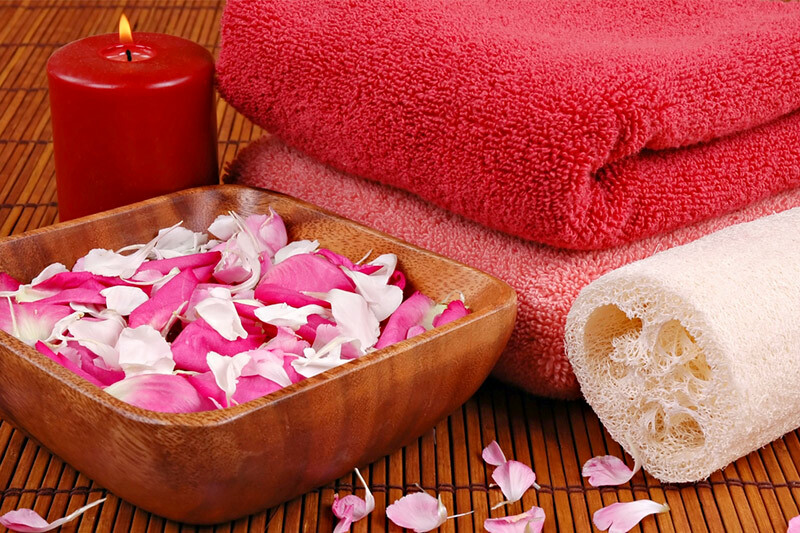 The hotel offers excellent leisure facilities, high standards of comfort and excellent restaurants. The hotel’s exquisitely designed 355 guestrooms include 7 tastefully decorated designer suites, 54 exclusive Club President rooms and 44 well-appointed deluxe suites to suit guests’ requirements. 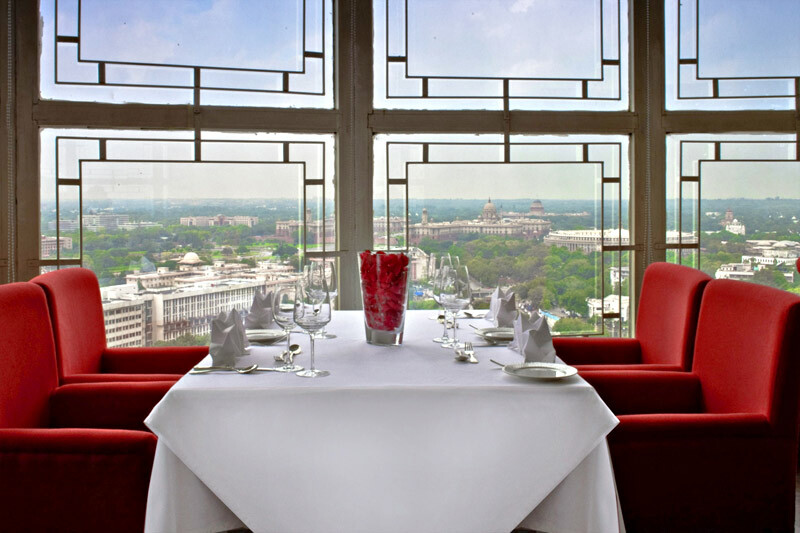 The view from the room is breathtaking overlooking Lyutens Delhi, covering the presidential estate, India Gate and Parliament of India. 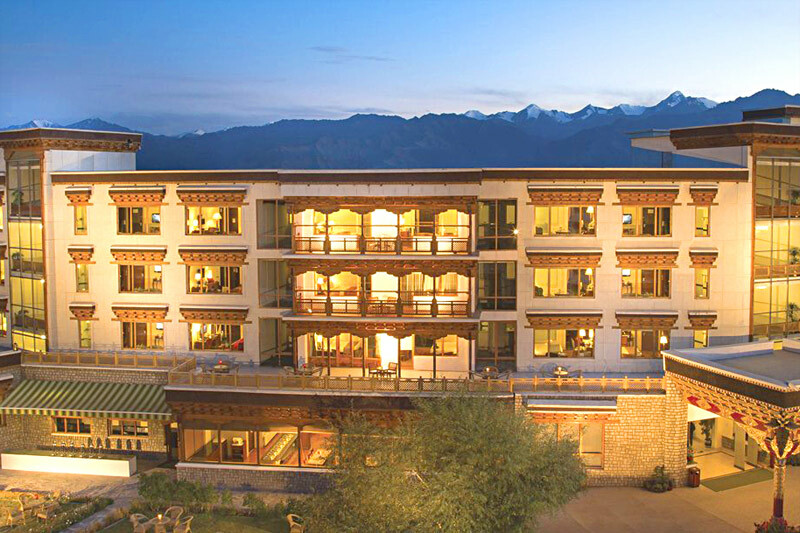 The Grand Dragon is the only Star luxury hotel in the spectacular mountain kingdom of Ladakh, a land of scenic beauty mystic culture. It is owned and operated by Abdu family from Leh. 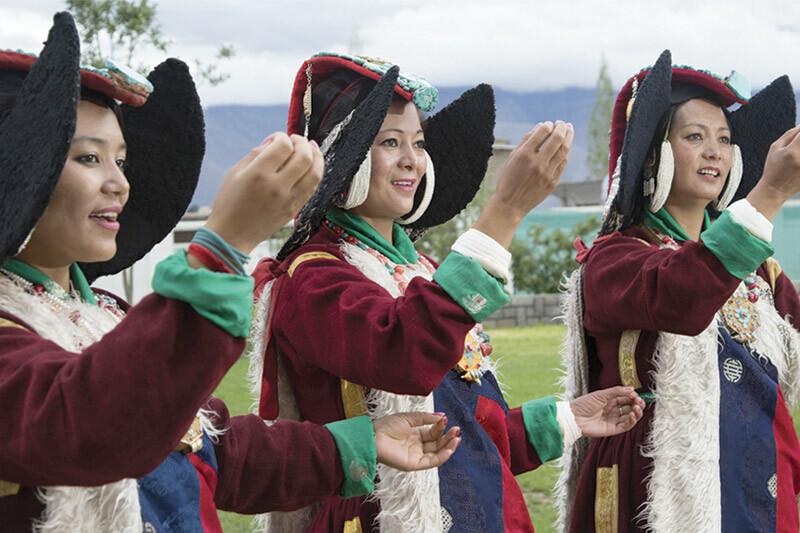 In the ancient city of Leh, the Grand Dragon extends a warm and luxurious welcome to the guests from India and around the world. 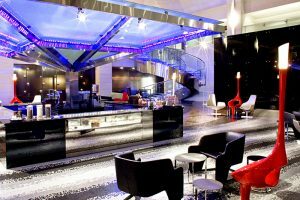 The extensive expertise in catering to the needs of travelers has enabled the ability to offer exceptional services with a commitment to make every stay an unforgettable experience. The hotel blends traditional architecture with luxurious accommodations to create a unique experience. With a ‘go green’ philosophy, Grand Dragon respects the environment in which it lives and operates. Therefore, 95 solar panels are implemented for central heating. These panels are used to heat water in the bathrooms. The under-floor heating of the bathrooms is done with a steady stream of hot water. 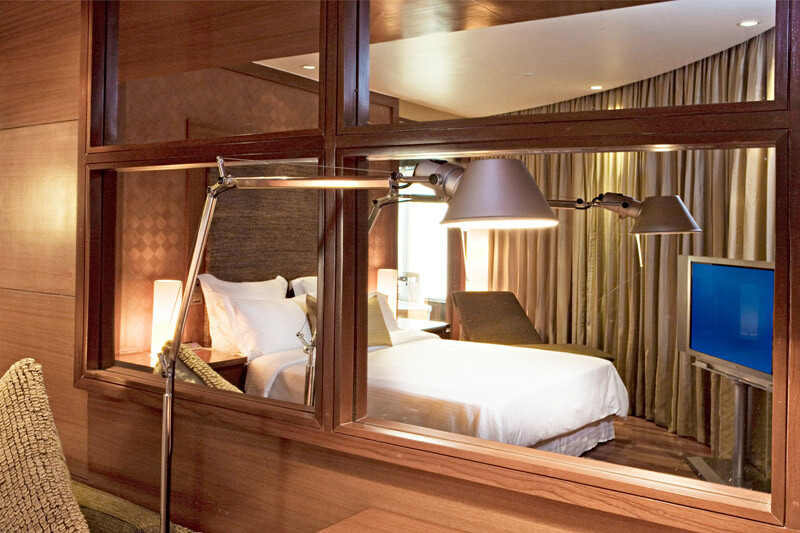 Aesthetically decorated and furnished, the deluxe rooms have all the luxuries that a person can ever desire. The bathroom is equipped with modern fittings and Quebec Shower. 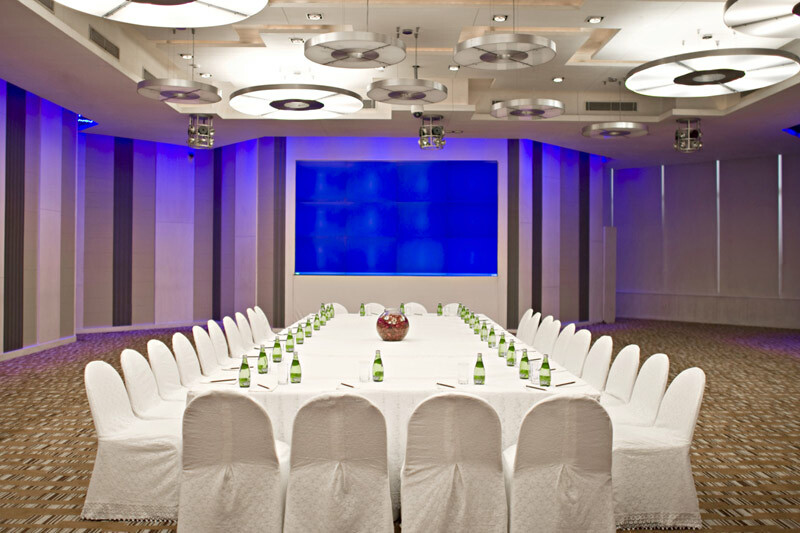 Other facilities at the room includes Telephone, LCD TV with satellite channels and much more. 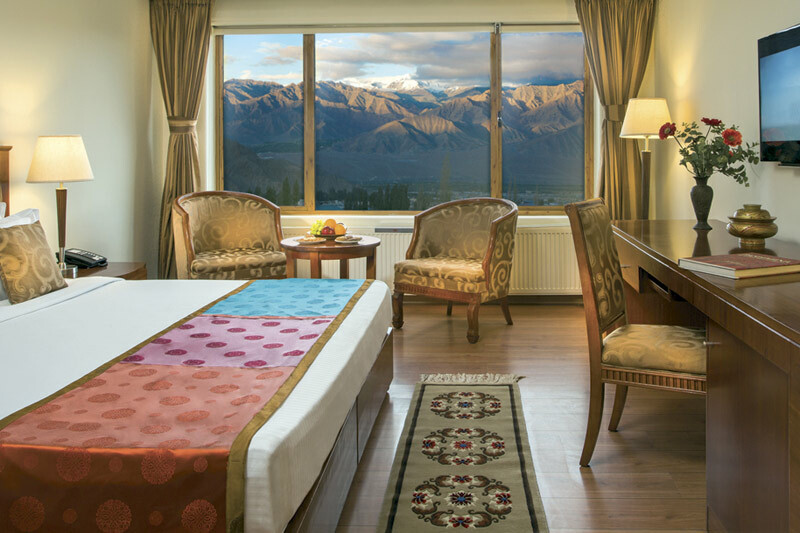 Facing to the south, the large windows of the deluxe rooms offer a panoramic view of the gorgeous snow-covered Stok ranges. 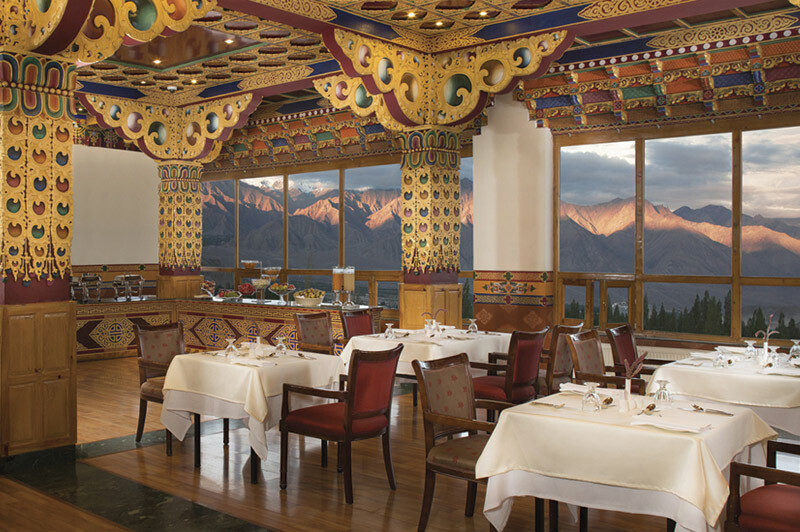 While the north-side of the room provides a magnificent view of the beautiful Leh Palace and Khardongla Pass, the world’s highest motorable road.